It is that time of year, when once again we review the past year and consider what good was accomplished, and if anything was not to our liking and whether or not there is any way we can address that. At the same time, we turn our attention to the new year entering in and wonder what challenges and opportunities it will bring our way. What are some of the eco-friendly material considerations that make sense today and looking forward ? Recycled Steel is an excellent choice that saves trees and is more durable in the presence of high winds or earthquakes for building frames. Did you realize that a 2,000 sq ft house uses up to 50 trees in the framing ? The same building framed in recycled steel will use up the remains of approx 6 scrapped cars. 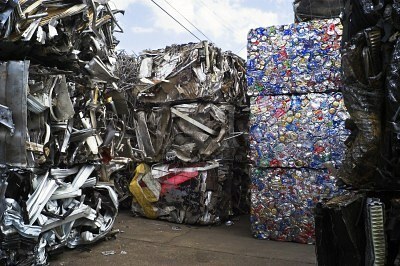 In 2011, 2.2 million tons of scrap steel from cans were recycled. In construction and transportation products, there is a high recycling rate – 95% in regards to automobiles, for example. Over the past 50 years, more than 50% of the “new” steel produced has ultimately been recycled. 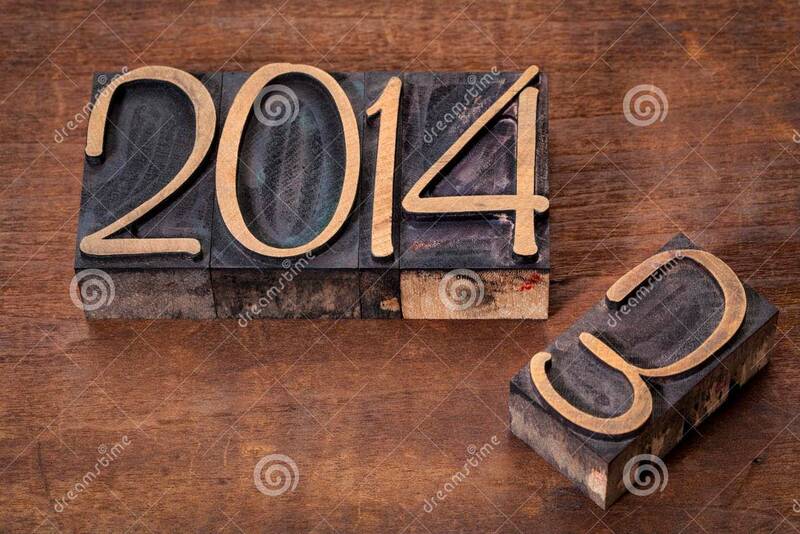 In 2012, the overall steel “recycled” rate was 71%, compared to only 15% recycled back in 1988. Recycled steel requires 75% LESS energy in its manufacture than “virgin” or “new” steel would require, while reducing the solid, enduring load on landfills. Another concept that is actually “growing old” (60 yrs) now is the idea of cast-in-place concrete walls that are sandwiched between two layers of insulation material. We have considered that for our own building plans regarding a subterranean shelter and feel that insulating the exterior of a concrete mass does indeed make energy efficient sense but are concerned that using the foam insulation on the interior side wastes the mass that could hold heat and cool over longer periods of time; and therefore, require less energy to bring up to a comfortable temperature. To my thinking the whole consideration of concrete and insulation is an example of the kind of complex consideration that I really like to bring awareness to in this blog. Construction work with foam blocks filled with concrete is quick and easy in one sense but more time consuming in another. The work can only be accomplished in small bits, that must be allowed to cure, before another bit can be added in. Cold joints between these sections might prove an issue of concern over time. In traditional concrete forming, it is true that plywood is utilized for forms but those forms are given the longest useful life that can be squeezed out of them. Meaning they are re-used over and over again. Personally, I have some concerns about embedding such inorganic materials as polystyrene into the environment, though that is not a total stopper for me. As to the insulation on the interior, it does complicate good, strong attachments for such additions as weight-bearing shelving. A plus for concrete is that is it is both re-usable and recyclable. There is no easy answer to whether the pluses or the minuses of concrete filled insulating materials determine a decision that remains both personal and still somewhat theoretical. An exciting development is the plant-based (bamboo, hemp and kelp) polyurethane rigid foam developed by Malama Composites. This “new” material is finding its way into insulation, wind turbine blades, furniture and surfboards. This particular composition of foam has a high moisture and heat resistance, excellent acoustics and protects against mold and pests. It also has a higher R-value than fiberglass or polystyrene. A living laboratory for R&D on advanced sustainable energy technologies is the Building Technology Showcase of the Fraunhofer Center for Sustainable Energy Systems headquarters in Boston’s fast-growing Innovation District. This was a deep energy retrofit of a 100-yr old bulding completed in 2013 combining cutting-edge design concepts and historic architecture. Solar energy remains an important development in green building decisions. 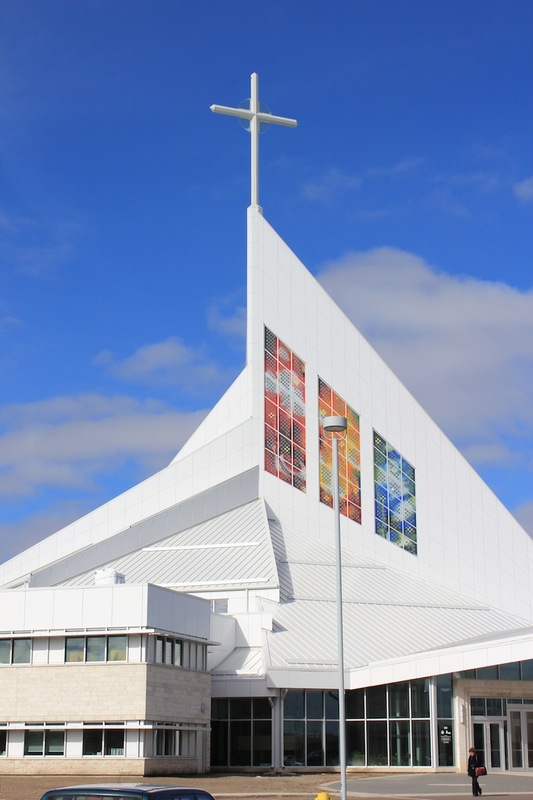 My favorite is the Cathedral of the Holy Family in Saskatoon, Canada (the city has an average of 2381 hours of sunshine annually) who had 1,013 silver solar cells hand soldered into their stained glass windows – how’s that for marrying the new to the old ? Like the sun, the wind is an ever present, non-depletable and sustainable resource for energy. Wind turbines are an increasingly common feature in our planet’s landscape. 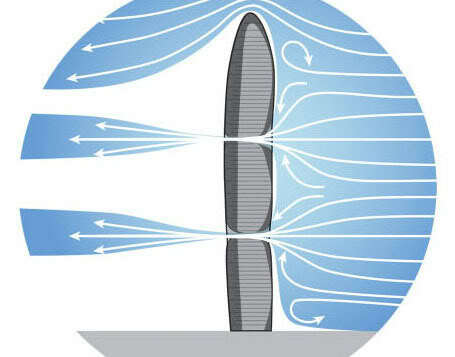 Another method of utilizing wind is to provide nature ventilations to buildings to increase breathability, an increasing concern with today’s modern, “tight” buildings. One of the most innovative is China’s Pearl River Tower that pushes air through wind turbines to power the building and reduce the natural wind impacts against its 71 stories. It is said that fresh, drinkable Water will become our planet’s most scarce resource in the coming years, so the recycling of water becomes ever more important. One way is to collect and recycle precipitation. One such application of rooftop tanks on the Bank of America Tower in New York captures up to 70,000 gallons of rain and filters that for use in cooling the building and flushing it’s toilets. A lack of connection to Nature can have damaging effects on the human psyche, so more architects and designers build “green spaces” into their projects. These may take the form of living walls, or rooftop vegetation. 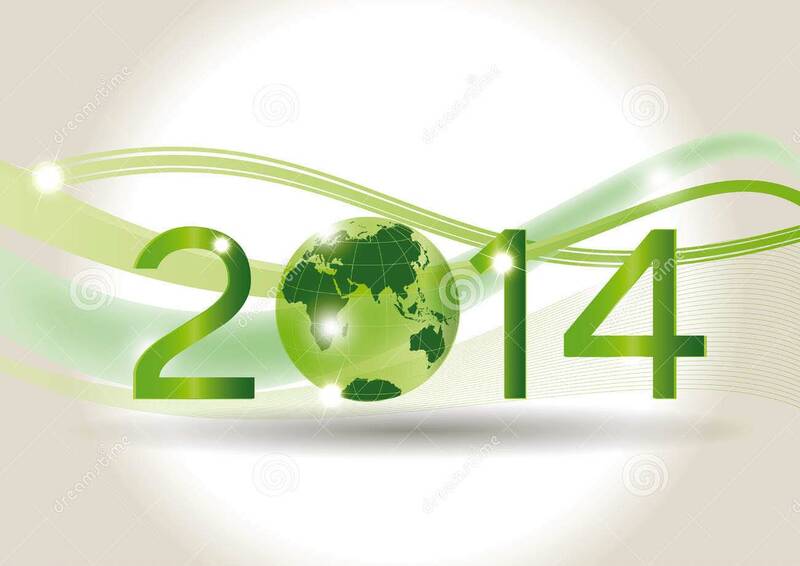 Wishing you the greenest new year yet . . . .